The WAP561 has a very broad feature set. The list below comes mainly from the data sheet. The web admin interface is essentially the same introduced in the WAP121 and WAP321. It still requires a wide (> 1024px) format screen, so isn't tablet and notebook friendly. You'll find yourself doing a lot of horizontal scrolling, especially in the status screens. I covered most of the features in the WAP321 review, so I won't repeat that walkthrough here. There are a lot of features and nuances, so you should download the admin guide if you want a deep dive. The WAP551 and WAP561 devices support Single Point Setup. Single Point Setup provides a centralized method to administer and control wireless services across multiple devices. You use Single Point Setup to create a single group, or cluster, of wireless devices. After the WAP devices are clustered, you can view, deploy, configure, and secure the wireless network as a single entity. After a wireless cluster is created, Single Point Setup also facilitates channel planning across your wireless services to reduce radio interference and maximize bandwidth on the wireless network. The video below walks you through using Single Point Setup. Actually, Single Point Setup looks like it has been rolled out to the WAP121 and WAP321 as well. At least that's what the online emulators that I discovered via this Cisco Blog post show. The WAP emulators include some multi-AP emulated networks, too. These screens are static, but at least you can get the idea of what SPS does. The 561's specs cite load balancing and fast roaming handoff. But there are no controls that I could see for these features in the SPS screens or anywhere else. The is a Bandwidth Utilization control in the Wireless settings. It controls how much of the AP's bandwidth can be used before it stops allowing new client associations. This is set to 70% by default and appears to apply to the AP as a whole, not each radio. The gallery below has a few closer views of the 561's board and SPS screens grabbed from the emulator. Top view of the board. The two radio modules and RF can top for the CPU and memory have been removed. This emulator view of the Single Point Setup feature shows 11 APs in the cluster. There can be a max of 16. This view shows what each AP is doing, You can sort and filter the view by any of the column attributes. Channel assignment can be automatically managed or manually set. The WAP561 is Wi-Fi Certified. Radio 1 defaults to 802.11b/g/n (2.4 GHz) mode, 20 MHz bandwidth and auto channel assignment, while Radio 2 defaults to 802.11a/n (5 GHz), 20/40 MHz bandwidth and auto channel assignment. Radio 2 can also be set to 802.11a and 802.11n 5 GHz modes. But Radio 1's mode can be set to either band with choices of 802.11a, 802.11b/g, 802.11a/n, 5 GHz 802.11n or 2.4 GHz 802.11n. Both radios are disabled by default, but set to the default ciscosb SSID. Getting initially setup is a bit confusing since all the settings you need are scattered among multiple screens. so I recommend using the Setup Wizard to ensure that SSIDs, security and frequency bands get configured the way you desire. When you do enable the radios, WiFi Protected Setup (WPS) is enabled by default. Given the business nature of the product, I didn't test it. I also didn't run 40 MHz Coexistence and Fat channel intolerant tests. I used Channel 6, 20 MHz bandwidth mode for 2.4 GHz tests and Channel 153, 20/40 MHz bandwidth mode for 5 GHz tests. WPA2/AES secured connections were used in both cases. The AP was placed horizontally in the test chamber on a 3" plastic stand. Given the 9" size of the AP, its closest surface was around 7.5" from the test chamber antennas vs. the usual 8". Because the WAP561 is not a router, you'll find it in the Wireless Charts, not the Router Charts. It's the only N900 class AP in the charts, there isn't anything to compare it with. The good news is that it was tested with the new chamber-based test process, so we have a good view of its performance over its entire signal range. Fortunately, I also tested Ubiquiti's UAP-AC AC1750 class AP using the new process. And since the 2.4 GHz side of an AC1750 AP is N450 class (3x3), I can compare these two products in that band below. The 2.4 GHz downlink plot shows the Cisco starting out with higher throughput, but starting to fall off after 15 dB of attenuation. The Ubiquiti starts out with lower throughput, but doesn't start its decline until after 30 dB. This and the fact that the WAP561 disconnected at 57 dB indicates better 2.4 GHz downlink range for the Ubiquiti. The two products are more evenly matched for 2.4 GHz uplink, but it looks like the Ubiquiti still has a slight range edge. For 5 GHz, I chose the ASUS RT-N66U to compare. It's a router, not an AP, but it is an N900 class product, so the comparison is fair. Since the Charts don't let me mix APs and routers, I had to cobble together the plots below. The 5 GHz downlink plot shows the ASUS with superior range over the Cisco since its throughput holds steady out to 30 dB of attenuation. The ASUS' superior range holds true also for 5 GHz uplink. The WAP561 has a good feature set that should put a smile on anyone charged with managing a small multi-AP wireless LAN. No controller to set up, manage or pay extra for, automatic channel management, captive portal and rogue AP detection are among its pluses. 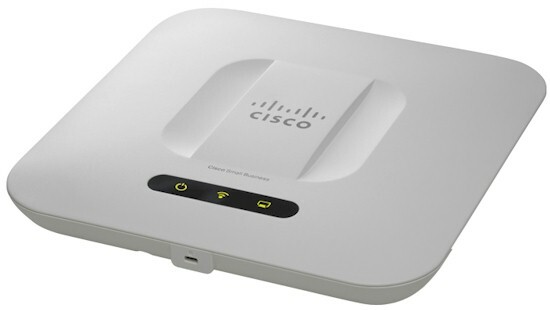 But I had hoped for more sophisticated load management controls and some idea of how fast handoff would work.And it doesn't appear that Cisco's "Smart Signal" antenna system provided a performance edge over a consumer router priced much lower, albeit a best-in-class one. And finally, a little graphics thrown into the administrative views would have been nice to help better visualize larger multi-AP networks. In the end, the main thing going against the WAP561 is that it's an N900 AP, and a fairly pricey one, in a world that's fast moving to 802.11ac. But if you're looking for business grade AP features with controller-less multiple AP management, the WAP561 could be worth checking out.